We have been supplementing her feedings with formula, and we finally seem to have found one that doesn’t upset her stomach, Enfamil A.R. The A.R. stands for Added Rice or something like that. I guess the formula is designed to expand in the baby’s stomach so it’s harder to spit up. Although, the few times she has managed to spit it up it’s been even grosser than usual. Yuck. Anyway, the NICU and her pediatrician gave us a bunch of samples so we could find the right formula for her, and we finally ran out yesterday. Mike bought more at the store, and holy crap! Formula is wicked expensive. And, we discovered that you can’t just go into a grocery store and find the formula you want on the shelf, you have to go to the front of the store and ask for it. Mike did some research and we discovered that baby formula is a hot item on the black market. Who knew? I was fortunate enough to experience two of the wonderful joys of parenting within ten minutes on Saturday. First, Madeline peed on me. We had just weighed her and I was carrying her without a diaper on. I said to Mike, “I have to hurry up and get her back in a diaper before she pees on me…” and then she did. So I cleaned us up and got in her a new diaper, and I was carrying her back into our living room. I was holding her over my shoulder (her favorite way to be carried now) when she suddenly coughed and then I felt a warm, wet sensation on my shoulder, neck, hair and back. She’d thrown up all over me! Luckily I took the hit and it didn’t get on the carpet. Still, I wasn’t pleased with this parenting milestone! The other thing I dealt with over the last few days was much more irritating than bodily functions. Maddie needs to get a shot of something called Synagis every 28-30 days to protect her from something called the Respiratory Syncytial Virus (RSV). RSV is a really bad cold in adults, but in a preemie it could become bronchitis or pneumonia. There are only a few specialty pharmacies that provide Synagis and it has to be ordered weeks in advance. Maddie was supposed to get her shot this last Friday, the 15th. For some reason, the pharmacy that Maddie’s pediatrician went through decided to sit on the order for three and a half weeks before they processed it, and there were (allegedly) some insurance hang ups. I spent hours on the phone on Friday and over the weekend trying to get everything worked out. In the end, it wasn’t even an insurance hang-up that prevented her medicine from arriving on time, it was the pharmacy totally dropping the ball. Her pediatrician’s office was PISSED, and they are now going through a new pharmacy for her shot. 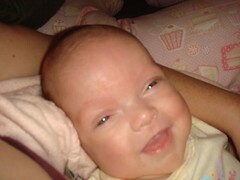 She will get her medicine tomorrow, and her pediatrician has assured me that she will be okay despite the delay. That doesn’t really change the fact that it was a very stressful situation over the weekend, I mean, RSV can be deadly. Luckily her pediatrician’s office has assured me that I won’t have to go through this ever again. Thank goodness!!! Hi Heather … this is a complete and total blast from the past, it’s Andrea Hanstein from USC (we knew each other through Deanne). Anyway, through some random MySpace chain, I found you and have been reading your blog piece by piece at work. I know I haven’t seen or spoken to you since my junior year at SC, but I wanted to tell you that you and your family’s story honestly moved me to tears. 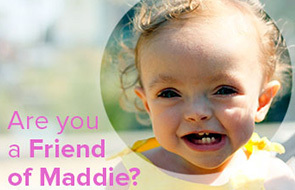 I am so happy Madeline is okay … she is beautiful. Sorry to sound like a total stalker, but your story really moved me. Good luck to you all.